and that is the Drupal community resources. who are working on Drupal and with Drupal every day. for communication and collaboration that you can take advantage of. when it comes to actually really working with Drupal. So in this lesson, we're going to take a look at the Drupal community documentation on drupal.org. Before we jump into building our first Drupal 7 site, we should also take a look at the great resources you have out there to help you on your journey. Being an open source project, Drupal has an amazing community of people who have paved this road before you. In this lesson we're going to look at the free community resources that you can use to not only find answers to your questions, but also connect with thousands of people around the world who are working in the same space you are. 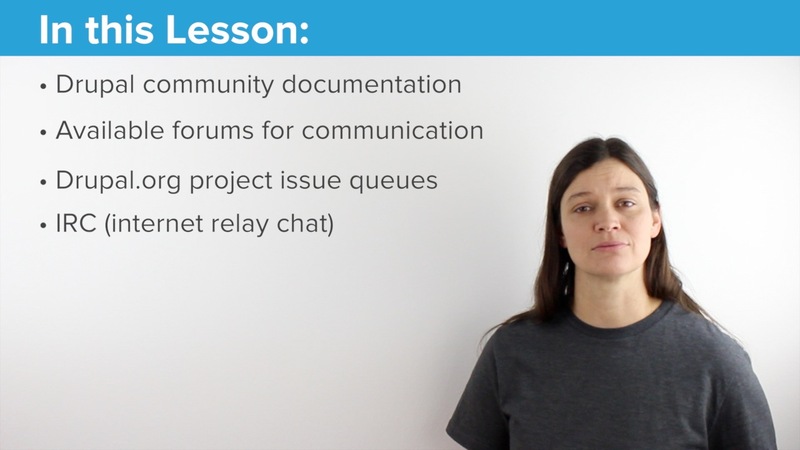 -- We are going to take a tour of the communtiy documentation, various Drupal forums, project issue queues, where you can glean a lot of useful information and help, Internet Relay Chat, or IRC, for real-time collaboration, and getting in touch with user groups of like-minded people around the world.